(To enjoy and learn from what you read you must understand the meanings of the words a writer uses. You do yourself a grave disservice if you read around words you don’t know, or worse, merely guess at what they mean without bothering to look them up. A week ago, one night, the mobile buzzed into my fitful sleep. I rarely get calls at night, but my son and daughter get excused. Not being aware of my snoozing issues, they go ahead and anxiously enquire ‘how my day is’ and ‘how I’m doing.’ I know they aren’t so happy about my refusal and finding me fending for myself a solitary retired position. It’s ‘after many pleas to come and stay with us’ fell short to convince me to move out of the house where I shared many memories with my wife who passed away two years ago. Instead they both, every night, in tandem keep me filling with their lives, children, and regular woes. And in the process letting me know, ‘we are with you’ in an alluring tone. I’m used to their way of mildly censuring me for my unrestrained, not minding about proper safety steps during my weekly photography jaunts. I loved to listen to those measured firm voices of my children dressing – me down. The whirr from the phone that night sounded more worried with a tone of urgency to it. As if crawling around pleading ‘pick me up.’ It’s from my son Aditya. Avoiding all the platitudes, he grumbled with a tone of impatience in his voice, ‘I want to write in English, I want to speak good English, what should I do.’ For a young adult who post-graduated from a London University, who has been watching his dad for the past thirty years engrossed in reading, teaching, of lately writing in English. It shocked and surprised me. Shocked, because my son was a sports freak and why this sudden fancy to English. His modesty surprised me the way he asked to help him; despite his age, qualification, and independence. I always believed scant vocabulary doesn’t allow many opportunities, for a man’s intelligence and his understanding of life and world, to grow imaginatively. Richness in imagination and richness in words go hand in hand. Vocabulary works like a pressure pump. The higher the stock of words you amass in mind the quicker and easier the ‘fluidity of speaking’ you could manage. It helps to become a forceful, vocal and powerful thinker, and invite more creative ideas to your mind. People don’t understand when I say, ‘vocabulary is like loose coins in a child’s pocket, the more he has, the more he moves with confidence, swanky, and lively.’ Adults are no different; the currency of vocabulary is the sure advantage that paves the way to success, increased confidence both in professional and social life. There isn’t any mystery in building up the vocabulary; it’s a skill that’s acquired and learned. If you wanted to enjoy more friends, you have to go out and meet them. Similarly, when you needed more words; you have to go out and collect them. The only turf where you can gather them is in books and then in reading. The more you read, the more loudly the coins tingle in pockets. The more eloquent the words would come out of your mouth. We have all enjoyed our favorite singers and their melodious voices from the first verse to the last. And the singers didn’t become the best overnight. They might have practiced with their good voice and gained the needful skills with consistent rehearsals for years and years, and finally one day we all have enjoyed their pleasing voices and songs. And we say, ‘Ah, what a voice! How lucky they are’? I say: It isn’t luck; it’s pure hard work. 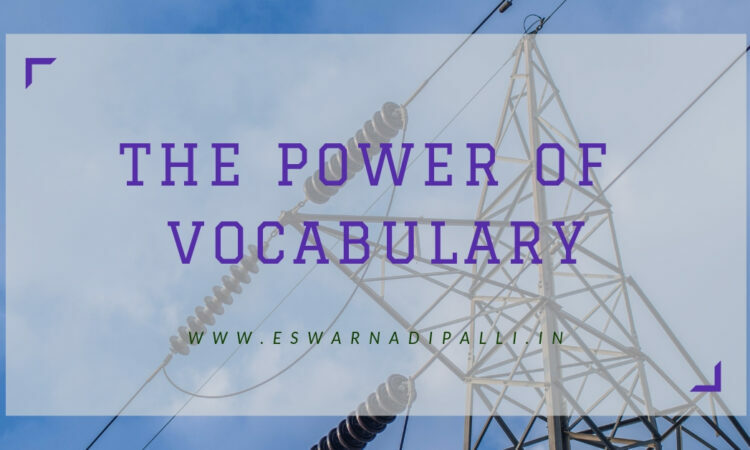 Comparably, the same rules and principles and practice holds good for mastering the skills of the English language and its decisive component: the vocabulary. We have to sit at a table, read and read any genre you can lay your eyes on. I recommend anything scripted in English. The list includes Classics, contemporary novels, short stories, reference books, newspapers, magazines, Reader’s Digest, Political magazines, comics. For me, it’s a daily reading appetite for thirty years – dog-eared, penciled, neatly wrapped, underlined, marked, tagged, dusted, a few untouched – some thousands of books. I painstakingly read glued to the chair for hours with a pencil in hand, underlined the hard words, new words, and a dictionary close by scribbled the meanings along the margin. Before the onslaught of digital technology, I have had a good exercise to hand turning the pages of large bounds of dictionaries looking for every word and its meaning. Today digital dictionaries rule the roost. Reading habits are on its verge of vanishing. I could see the irony when the availability of books got easy through devices like Kindle and online libraries, and digital dictionaries; the current generation hardly bothered to fiddle with books let alone be smart and excited about skimming through them. I always assumed richness and strength of vocabulary has been the primary ‘link factor’ in English-speaking effectiveness. Because I found the English language is the most subtle and fluid of all languages. To catch and keep it in our grips, we need to chase every minute, and every day like the young run behind their lady loves. Besides a fund of vocabulary, the other factors will be the pronunciation, the nuance of a word and its connotation also play a very significant function in the communication process of our thoughts, ideas, and facts. The delusion suffered by the English language seeking generation is they cannot distinguish between the reading vocabulary and the speaking and the writing vocabulary. Perhaps they seemed deceptively complacent flaunting their vast reading vocabulary. But enter the everyday challenges like to pronounce an intent, vocalize the issues, enunciate an idea many young adults moan how their reading vocabulary would betray them at every turn of their otherwise well-planned personality. They find themselves tongue-tied, dried, deserted; the expression caught stuck knotted in vocal cords. Speaking and writing English language demand lots of usable words. Reading every day; searching and gathering as many as ‘vocal words’ lubricates the speaking muscles to facilitate a free flow of style and emphasis of the language. Underline as many as usable words in reading sessions and use them as freely as you could manage and notice how quickly it brings about changes in your confidence, and way you think and feel. It guarantees to invite luck, success, and goodwill. Without a reservoir of vocabulary bursting within, for sure, the thinking and intellectual horizon would shrink quick and fast. Huge store of Vocabulary means a healthy mind, a strong individual with a clear sense of identity, competence, and worth. Vocabulary and success in life both socially and professionally go together. One irresistible reward of stockpiling of the vocabulary gives the ability to comfortably and easily converse with different people in a variety of settings. Conversation is a core stimulant in any relationship building. Once you gain a firm grip on vocabulary necessary to become a confident conversationalist, you can reap immediate benefits in all areas of life. It helps you in the quality of relationships, professional life, and in the ability to grow as a person.